...or he might not be. We provided for a PB/NG show about 15 years ago. The main (only?) thing I remember was that Neil had a talkback mic that went to the FOH near field monitors. During both soundcheck and the show itself, Neil repeatedly berated the FOH engineer and gave him specific level and eq instructions. Never seen anything like it before of since. My personal observations of that era are identical. You haven't worked a Pat Benatar Neil Giraldo show, I take it? By far he's not the only one, though. There are plenty of guitar-slingers that can't seem to create "my tone" without huge amounts of SPL. I wonder if part of what they like also involves human auditory physical compression and Temporary Threshold Shift in combination with the actual sonic content of the guitar rig's output. The human phys element would also help explain why some guitarists claim their rigs record differently than they sound live. If nothing changes except putting the player in cans or listening via control room monitors what has changed is the player's environment, not the rig... but I digress. The guitar is a wonderful instrument. It can be a weapon of musical disruption or it can be a machine to kill Fascists or it can serenade your friends. I wish it could be used in friendlier SPL ranges sometimes. And at that level there should be no reason not to isolate the cabinets from the audience or use power reducers to get "your sound". Even if it means a flat pack iso cabinet the size of a small room. Def Leopard 1987 Hysteria tour, at Alpine Valley WI with the great Robert Scovill mixing. The sound was crystal clear and I would guess the average level was 100 dB or so, 2/3 of the way back within the shed. There were times the audience sing-along level slightly dominated what was coming out of the sound system. Even with what is now 30 year old technology, the sound beat a lot of what I hear today. Pat Travers still remains the loudest stage rig I've ever heard. Drove everybody out of the club. Band and crew were great to work with, but that guitar was just unbeleivably loud. I get that levels will vary - and I am quite forgiving within limits but it is such a shame when it makes that much difference to comfort levels to send folks away. What part of forcing their fans to leave the building don't they understand??? You miss the point. It's not only about running an amp at some volume level to get it to break up in a particular way, it's also about the acoustic interaction between the guitar and the sound on stage. Long before you get to the point of Santana like feedback the sound of the guitar will bloom and react differently when hit with airborne soundwaves. It doesn't take a wall of full stacks to do this, but it doesn't work with a Quilter and an iso cab either. I've seen this as well while attending a "Neil" show. 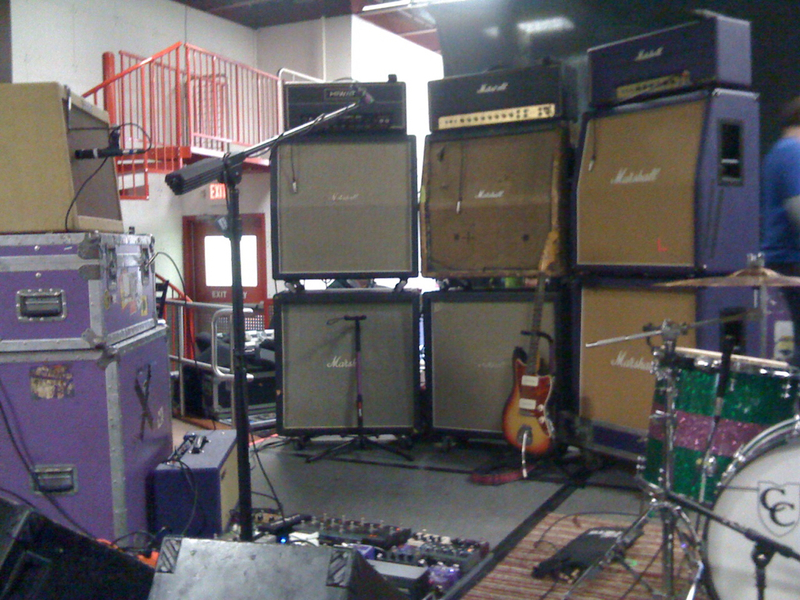 The venue was fairly small (4000 capacity) and the sound, if you want to call it that, from Neil's rig was overwhelming. We left early, went to a bar down the street where we could still hear the band at a much lower volume, then got drunk. Best he's ever sounded, so I guess for the best results the layout should include a wall between Neil and the rest of the world. Maybe Sennheiser should get into the guitar pick up business. I'm sure if they made a guitar compatible E835 no one needs a loud amp to get the distortion and feedback they are looking for. Dinosaur Jr was one for me. Three full stacks with two fenders in front and a vocal mic within a few feet of it all. This was in a 500 cap club. He had to leave one full stack in the truck because he couldn’t fit it on stage.